Many hair restoration patients ask us about the benefits of having a hair transplant versus medications offering thinning hair remedies including Propecia (finasteride) and Rogaine (minoxidil). The situation for each patient is varied and the answer is dependent on the amount and pattern of a patient’s hair loss. For example, if a patient comes in seeking advice and is just in the beginning stages of losing hair, we may recommend Propecia (finasteride), Rogaine (minoxidil) and/or laser therapy. Regardless of where you are in hair loss, these medications can halt or slow down the genetic process of losing hair. We recommend them for our patients because stabilizing the hair loss will ensure that they will protect their native/natural hair for as long as possible. Certain hair loss medications like Propecia (finasteride) and Rogaine (minoxidil) work best in the crown and not typically as well on the frontal region of the head. We have seen great results from transplanting the frontal to mid scalp area, and utilizing medicines to help enhance the crown. 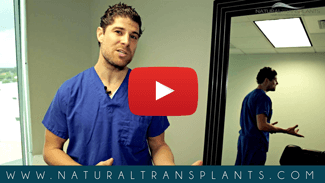 The team at Natural Transplants, Hair Restoration Clinic always makes it clear to hair loss patients that hair transplants do not stop your non-transplanted hairs from falling out. When a doctor transplants 6,000 hairs, we do not want to see you lose the rest of your non-transplanted hair in the next few years. We want to make sure that you’re aware that a good combination is utilizing both replacement and hair loss medication like Propecia (finasteride) or Rogaine (minoxidil). Be advised that some medicines including Propecia (finasteride), Rogaine (minoxidil) have a low risk of side effects.